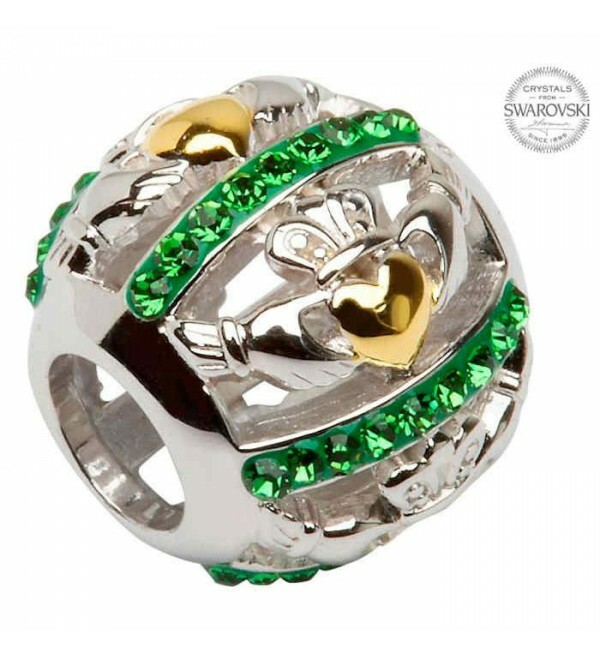 This beautiful sterling silver bead features decadent emerald crystals from Swarovski® and Claddagh symbol with two hands clutching a gold plated heart that is topped with a crown. Tara's Diary collection from ShanOre Irish Jewelry offers breathtaking Pandora and Chamilia-compatible charms available nowhere else. 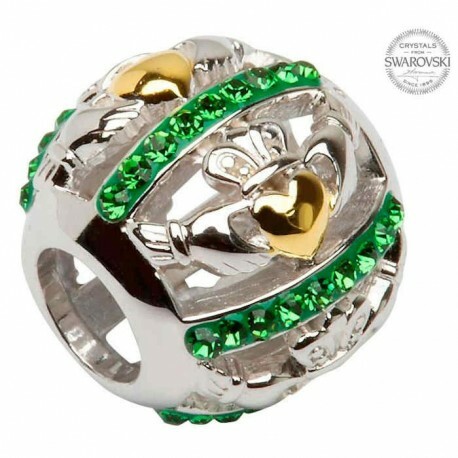 This beautiful sterling silver bead features decadent emerald crystals from Swarovski® and Claddagh symbol with two hands clutching a gold plated heart that is topped with a crown. The emerald is a mystical and well-loved crystal that contains impressive significance. Emeralds are said to promote balance and loyalty, and acts as a symbol of friendship. It serves as note of hope and commitment through unconditional love. The striking green color promotes spiritual healing, encourages prosperity and wealth, and is reminiscent of the luscious green hills of the Emerald Isle. The Claddagh is a suitable pairing with the emerald, as it represents similar values. The two hands address friendship, the heart demonstrates love, and the crown is considered to be loyalty. The Claddagh Gold Plated Bead, from the Tara's Diary collection, makes a thoughtful gift for someone who embodies the characteristics of the emerald, acting as a wish of hope for future success. Consider gifting it alongside a sterling silver charm bracelet to help start her collection.